November 1948 Mrs. Emma Fisher Hostess to W.C.T.U. 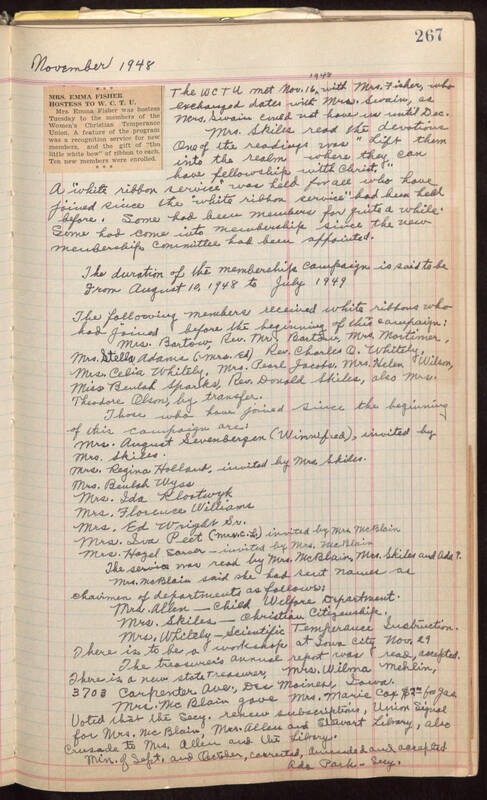 Mrs. Emma Fisher was hostess Tuesday to the members of the Women's Christian Temperance Union. A feature of the program was a recognition service for new members, and the gift of "the little white bow" of ribbon to each. Ten new members were enrolled. The WCTU met Nov. 16, 1948 with Mrs. Fisher, who exchanged dates with Mrs. Swain, as Mrs. Swain could not have us until Dec. Mrs. Skiles read the devotions. One of the readings was "Lift them into the realm where they can have fellowship with Christ." A "white ribbon service" was held for all who have joined since the "white ribbon service" had been held before. Some had been members for quite a while. Some had come into membership since the new membership committee had been appointed. The duration of the membership campaign is said to be from August 10, 1948 to July 1949 The following members received white ribbons who had joined before the beginning of this campaign: Mrs. Bartown, Rev. Mr. Bartow, Mrs. Mortimer, Mrs. Stella Adams (Mrs. Ed) Rev. Charles O. Whitely, Mrs. Celia Whitely, Mrs. Pearl Jacobs, Mrs. Helen Wilson, Miss Beulah Sparks, Rev. Donald Skiles, also Mrs. Theodore Olson, by transfer. Those who have joined since the beginning of this campaign are: Mrs. August Sevenbergen (Winnifred), invited by Mrs. Skiles. Mrs. Regina Holland, invited by Mrs. Skiles. Mrs. Beulah Wyss Mrs. Ida Klostwyk Mrs. Florence Williams Mrs. Ed Wright Sr. Mrs.Sua Peet (Mrs. C. L.) invited by Mrs. McBlain Mrs. Hazel Sarver - invited by Mrs. McBlain The service was read by Mrs. McBlain, Mrs. Skiles and Ada T. Mrs. McBlain said she had sent names as chairmen of departments as follows: Mrs. Allen - Child Welfare Department. Mrs. Skiles - Christian Citizenship. Mrs. Whitely - Scientific Temperance Instruction There is to be a workshop at Iowa City Nov. 29 The treasurer's annual report was read, accepted. There is a new state treasurer, Mrs. Wilma Mehlin, 3703 Carpenter Ave., Des Moines, Iowa. Mrs. McBlain gave Mrs. Marie Cox $2.00 for gas. Voted that the Secy. renew subscriptions, Union Signal for Mrs. McBlain, Mrs. Allen and Stewart Library, also Crusade to Mrs. Allen and the Library. Min. of Sept. and October, corrected. awarded(?) and accepted/ Ada Park - Secy.